YouTube hopes its users will be just as willing to watch full-length feature films as they are clips of laughing babies. Beginning Friday, the video-sharing site will dip its toe into the movie-rental business, starting with five films from the past two Sundance Film Festivals. Details about how exactly the service will function are scarce, and YouTube didn't respond to requests for comment. What is known is that users will pony up a rental fee of a few dollars and have 24 to 72 hours, depending on the film, to watch the movie as many times as they want. The initial slate of offerings includes Homewrecker, Bass Ackwards, Children of Invention, One Too Many Mornings and The Cove. At first glance, it's an odd step and a markedly different business for YouTube. 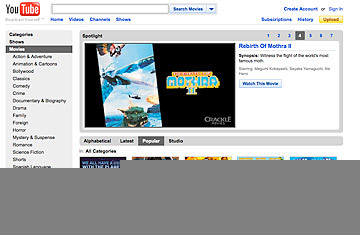 The site's revenue comes from the advertisements (served by corporate parent Google) that run along with the video clips. But the site, which incurs massive bandwidth costs from millions of simultaneously streaming videos, has yet to turn a profit. YouTube has long had an interest in partnering with major studios for a foray into the rental business, but at this point it is late in the game: Apple's iTunes began offering movie rentals in 2008, and Amazon.com has a movie store as well. The 800-pound gorilla in online cinema remains Netflix, whose on-demand streaming system lacks new releases but offers unlimited streaming of some 8,000 older titles, from WALL-E to Cool Hand Luke. All those platforms have built-in advantages that YouTube lacks. Through Apple, movies can be watched on the computer screen and on devices like Apple TV and the iPhone. Amazon has a healthy customer base already built in, and Netflix has been aggressive about offering its service through third-party devices. Subscribers can select and watch films through certain DVD players and gaming platforms like Microsoft's Xbox. There's no suggestion that YouTube's selection of movies will be watchable on anything but a computer screen, at least in the immediate future. Still, YouTube isn't completely outmaneuvered. The site has massive traffic and will benefit from (essentially) free advertising across Google's network: the search giant can run ads for the new rental platform on YouTube, in Google search results and in its suite of popular services like Gmail and Google Maps. Google also has an established payment platform in Google Checkout, which will make paying for the rentals relatively easy. But what may set the service apart is independent films. Alongside the rental program, YouTube is launching a program called "Filmmakers Wanted" that provides a platform for independent filmmakers to handle their own marketing and distribution via YouTube without relying on studios. According to the blog post that announced the plan, "They can decide the price of their videos and the rental duration; they can decide when and where their content is available; and they can keep 100% of their rights." Advocates of independent cinema say that low-cost option is sorely needed. "We are looking at what filmmakers need  and more and more, that means alternative distribution," Sundance director John Cooper told TIME. YouTube has already produced dozens of Internet stars. This new venture may end up launching the career of cinema's next great filmmaker. See how YouTube stars have cashed in on their viral videos. See the top 10 of everything for 2009.